You’ve heard about it, and by now, probably want it. 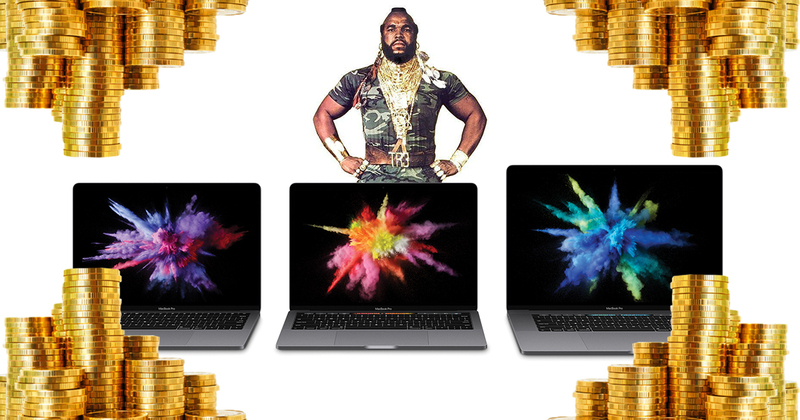 It’s the all new MacBook Pro update that many have waited years for. We’ve already covered how much it will cost to get one for yourself, but what if you can afford more than just maggi mee, and are feeling a bit generous with your bank account? As you know, unlike previous MacBook Pros, you can’t open up the recent ones easily by yourself to throw in more memory or storage. So before you hit that checkout option, do ensure that you’ll be okay with whatever specifications that’s in your cart. But always being the curious type, I decided to find out how much of a hole it will burn in your pockets if you maxed out EVERYTHING. Here’s basic 13 inch MacBook Pro, no Touch ID, no Touch Bar, and the same old function keys up top. Fully spec-ed, it costs S$3,728. Let’s find out what you get for this price. Pretty decent, I must say. For users who view the Touch Bar as a gimmick and don’t see themselves using it that much, this setup is a good option. They will be some recurring themes when it comes to the specifications though. So you want the ability to unlock your MacBook Pro with your fingertips, and have that super useful touch bar…but at the same time, still want to be able to bring it around easily. You will be sure to look at the new 13 inch model then. 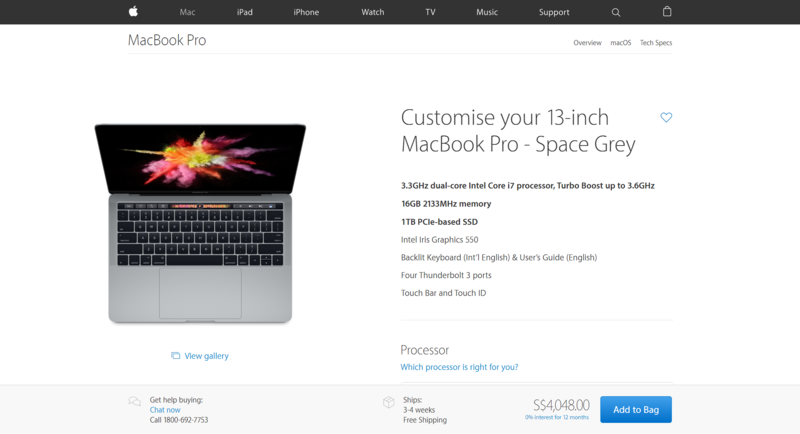 At S$4,048 when fully kitted out, you will be spending an additional $320 for the added convenience of that Touch Bar. But is that all? So in addition, you will get a better i7 processor, a higher clocked RAM, better internal graphics, while the 2 more Thunderbolt 3 USB Type C ports comes as standard. Depending on who you ask, the price difference is justifiable. Now we move on to the price point that will guarantee to make your heart sink. So if you’re a power user, and want something that can match your equally power-hungry ambition, then look no further than the 15 inch MacBook Pro. Don’t hold your breath for this one, you will need to shell out S$6,048 for the best of the best. This is what you get, aside from a bigger screen. 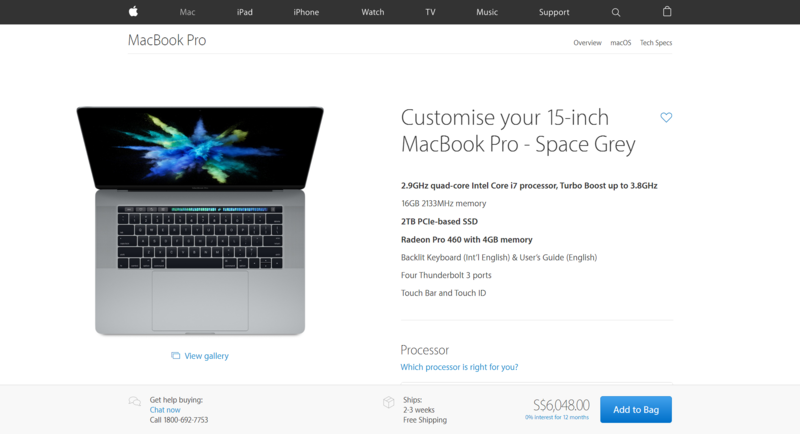 The processor is now a quad core i7. RAM is similar to the 13 inch model, but you get an extra bump to 2TB of super fast storage. The defining feature of this setup, though, is that Radeon Pro 460 by AMD. You can view their microsite here, which explains the added benefits that this graphics card will bring into your workflow. The reality is, unless you are a full-time creative professional who ticks all the boxes for any of them to fit directly in your daily work, you will most definitely be buying these laptops at the base specifications. Hey, if you want to go all out, we won’t judge either. If you told me to spend S$6,000 on an iMac or a Mac Pro, then yeah I will warm up to that, but seeing that they have left their iconic desktop in the dumps, I don’t see myself spending that kind of money on a laptop.